If you have two or more Macs, or an iPhone or iPod touch, you’ll undoubtedly want to keep your contacts and calendars on all your devices in sync. One way to do so is to use Apple’s MobileMe service ($99 a year for individuals; $149 for the five-user Family Pack). With MobileMe properly configured on each of your devices, any change you make to contact or calendar data syncs almost instantly with the other devices (and, in the case of the iPhone, syncs over the air). But what if you don’t want to pay for MobileMe, or if you simply prefer using the free Google Contacts and Google Calendars (both accessible from any Gmail account)? Google lets your iPhone or iPod touch connect to your Gmail account (either with a gmail.com address, or an address at your own domain via Google Apps) using Exchange ActiveSync, which provides over-the-air push e-mail, contact, and calendar data, just as MobileMe does. Meanwhile, Snow Leopard contains native support for Exchange 2007 servers in Mail, Address Book, and iCal, and Microsoft Entourage also supports Exchange accounts. So in theory, one should be able to store contact and calendar information in Google’s cloud, access it using your existing software, and configure all your devices in such a way that everything stays automatically in sync. Unfortunately, it’s not quite that simple. Although the iPhone and iPod touch work well with Google’s Exchange services, the same isn’t true of current desktop Mac software. You can sync your Google Contacts and Calendars with Address Book and iCal, respectively, but not using Exchange. As a result, syncing isn’t instantaneous or automatic. 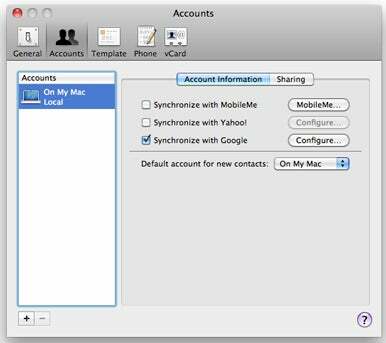 Likewise, Entourage can tie into OS X’s Sync Services to achieve syncing with Google Contacts and Calendars in a roundabout way, but setting up your Gmail account in Entourage as an Exchange account doesn’t work. 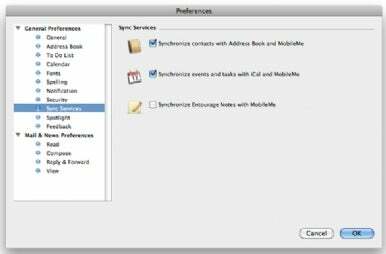 Nevertheless, you can replicate most of what MobileMe offers for contact and calendar syncing using Google’s services and Snow Leopard. The initial setup process is more complicated than with MobileMe, and you’ll have to adopt slightly different habits, but the end result should meet most people’s needs. However, I do want to mention a few qualifications up front. First, the process I describe here is for syncing a single person’s data among multiple devices, not for syncing information among multiple users. Second, on an iPhone or iPod touch, this procedure uses Exchange, but the iPhone OS currently supports only one Exchange account per device. So, if you already use Exchange for another purpose (such as connecting to your corporate e-mail account), this solution won’t work. And third, although most contact and calendar data syncs between Mac applications and Google just fine, a few items (including Address Book groups and the “floating” time zone in iCal) do not. Before changing your sync settings, you should perform a few preliminary steps. First, be sure to back up your contact and calendar data so that if anything goes wrong, you can restore it to its previous state. To back up the contents of the OS X Address Book, open Address Book (in /Applications), choose File -> Export -> Address Book Archive, enter a name and choose a location for the exported data, and click Save. To back up your iCal calendars, open iCal (in /Applications), choose File -> Export -> iCal Archive, enter a name and choose a location for the exported data, and click Save. To back up your Entourage contacts and calendars, open Entourage, choose File -> Export, select Items To An Entourage Archive and then All Items. Also, in the Archive The Following Items Types section, select the Local Contacts and Local Calendar Events items (you can deselect the other checkboxes) and click the right arrow. Leave the No, Keep The Items In Entourage After They Are Archived option selected and click the right arrow again. Enter a name and choose a location for the exported data, and click Save. If you’re using an iPhone or iPod touch, attach it to your Mac using its USB cable or dock and allow it to sync before proceeding. In addition, if you’re using Google Apps (for a custom domain name), make sure you’ve enabled Google Sync for your domain by following Google’s instructions. Finally, if you are a MobileMe user, I suggest turning off MobileMe syncing for contact and calendar data, as that will simplify setup and troubleshooting. To do so on your Mac, open the MobileMe pane of System Preferences, click the Sync tab, and deselect the checkboxes for Contacts, Calendars, or both. 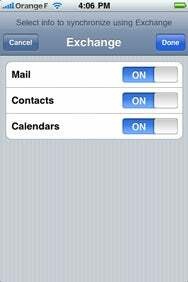 On an iPhone or iPod touch, go to Settings -> Mail, Contacts, Calendars, tap your MobileMe account, and turn Contacts, Calendars, or both off. When you do so, your device asks whether you want to keep or delete the existing contacts or calendars on your device. The safest option is to tap Keep On My iPhone, but due to the way Google stores information, this may result in some duplicated contacts or events. If you’re certain that the data on your Mac is correct, up-to-date, and backed up, you can reduce the chance of duplicates by tapping Delete From My iPhone. To sync Address Book with Google Contacts’ My Contacts list, open Address Book, choose Address Book -> Preferences, click Accounts, select On My Mac in the Accounts list on the left, and then click the Account Information tab. Select the Synchronize With Google checkbox, and then click Configure. If you’re setting up Google syncing for the first time, an alert appears explaining about the synchronization process; read this and click Agree. Then, in the dialog box that appears, enter your Gmail address in the Google Account field and your password in the Password field, and click OK. You may see a warning that Address Book can’t verify the identity of the server; if so, click Continue. To sync Address Book with Google Contacts, select Synchronize with Google and enter your Gmail credentials. Next, make sure the Sync menu (an icon with two arrows arranged in a circle) appears in your Mac’s menu bar. If not, open the MobileMe pane of System Preferences, click the Sync tab, and select the Show Status In Menu Bar checkbox at the bottom. Choose Sync Now from the Sync menu. During the initial sync, if the Conflict Resolver window appears, click Review Now, decide which version of each contact to use, and then click Sync Now. After the first sync, OS X should sync changes once per hour, although you can sync manually at any time by using the Sync Now command. (If hourly syncing is too infrequent, you might try the $25 Spanning Sync ( ), which syncs every time you modify a contact, and as often as every 10 minutes otherwise.) Repeat this procedure with each Mac you want to sync. 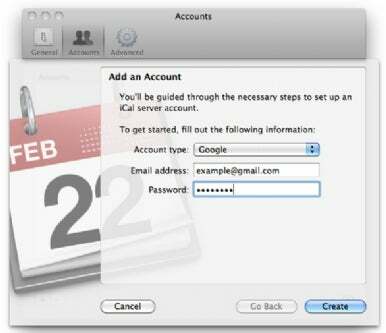 To sync iCal with Google Calendar, open iCal, choose iCal -> Preferences, click on Accounts, and click the plus (+) button. Choose Google from the Account Type pop-up menu, and enter your full e-mail address (whether ending in @gmail.com or your custom domain) in the Email Address field and your password in the Password field, and click on Create. You may see a warning that iCal can’t verify the identity of the server; if so, click Continue. Your primary Google calendar then appears in iCal. To sync additional Google calendars, click the Delegation tab in the Preferences window and select the Show checkbox for one or more calendars. The Snow Leopard version of iCal can set up syncing with Google Calendar automatically if you choose Google from the pop-up menu. Note that this entire procedure syncs existing Google calendars with iCal, but not the other way around. To move your existing iCal data into Google Calendar, find one of your calendars in Google on the left side of the screen, click the Settings button beneath it, click Import Calendar next to the Create New Calendar button, and then in the dialog box that appears, click Browse, navigate to the iCal backup file you created earlier, and select it. In the Import Calendar dialog box, select the calendar to which you’d like to add the events (if you have more than one) from the Calendar pop-up menu and then click the Import button to bring your calendar info in. By default, iCal syncs with Google Calendar every 15 minutes, but you can change the interval if you prefer. To do so, click on the Account Information tab in the Preferences window and choose a new value from the Refresh Calendars pop-up menu. As with contacts, repeat this procedure on each of your Macs. If you use Entourage to store your contacts and calendars, you can’t sync directly with Google Contacts and Calendars, but you can sync indirectly. First, follow the procedure for setting up syncing with Address Book or iCal and Google Contacts or Calendars (even if your OS X Address Book or iCal is empty). Entourage can tie into OS X's Sync Services to keep contacts and calendars in sync with Address Book and iCal. Turn on (at least) Calendars and Contacts to sync those items with Google. To sync your contacts and calendars, you must be using iPhone OS 3.0 or higher. Go to Settings -> Mail, Contacts, Calendars and tap Add Account at the bottom of the Accounts list. Tap Microsoft Exchange, enter the full e-mail address associated with your Google account in the Username field and your password in the Password field; leave Domain blank. Tap Next. If an Unable To Verify Certificate message appears, tap Accept. In the Server field, enter m.google.com, and tap Next again. Make sure Contacts and Calendars are turned on (plus Mail, if you want to sync your Gmail e-mail) and tap Done. When prompted to choose how to handle existing data, tap Delete. Synchronization begins momentarily, and everything happens wirelessly. Senior contributor Joe Kissell is the senior editor of TidBits and the author of numerous e-books about OS X.